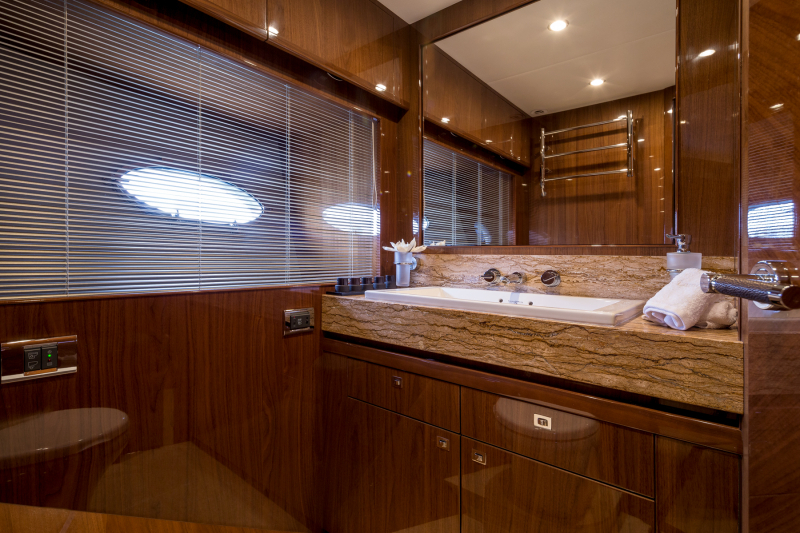 4 LIFE is a magnificent Princess 85 fly bridge Motor Yacht, built in 2013, with modern yet timeless design. 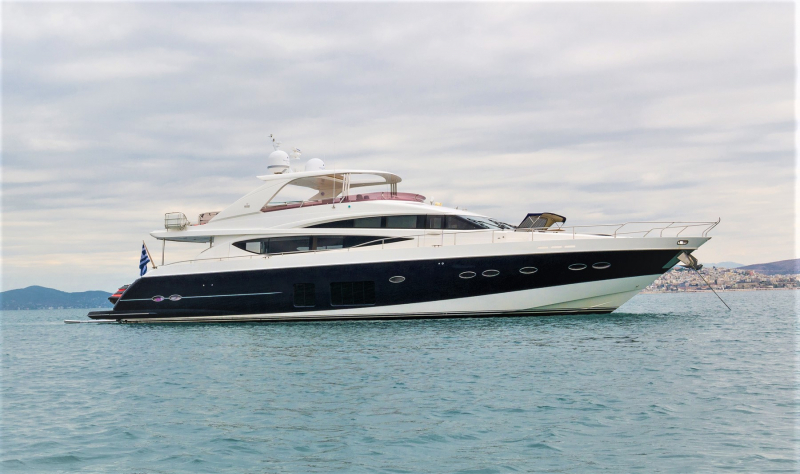 She was built in England and is one of the latest models of the world famous Princess Yachts shipyard and one of the newest yachts for rent in Greece. 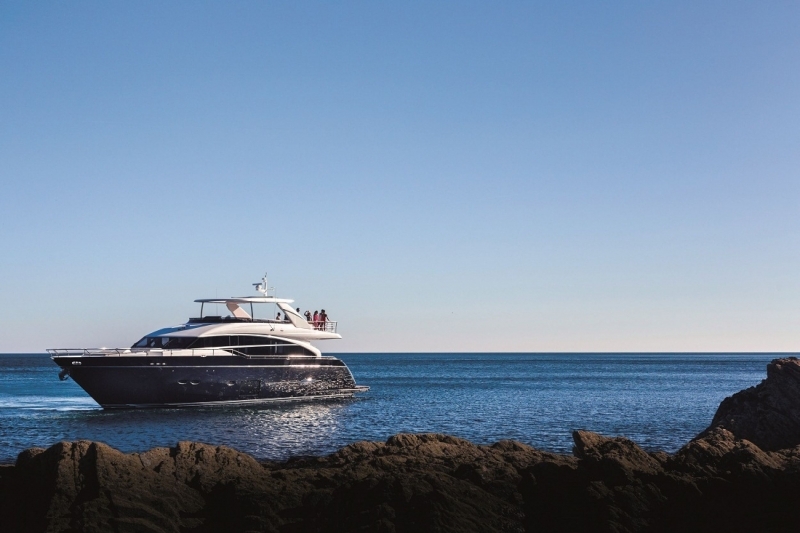 This truly unique motor yacht is definitely one of the best and most modern charter yachts in the East Med. 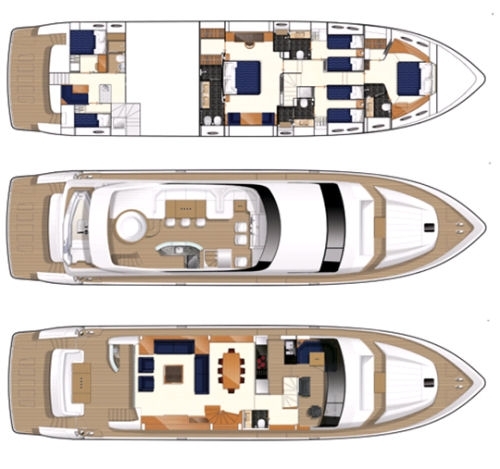 - STABILIZERS (Zero Speed & Underway), offering impressive stability and comfort at rest and while cruising. 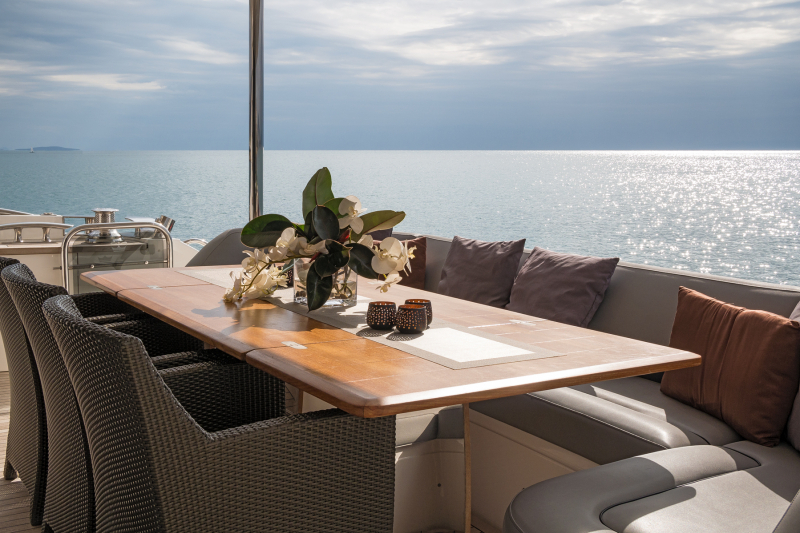 - Sinking swimming platform for easy access to the sea. 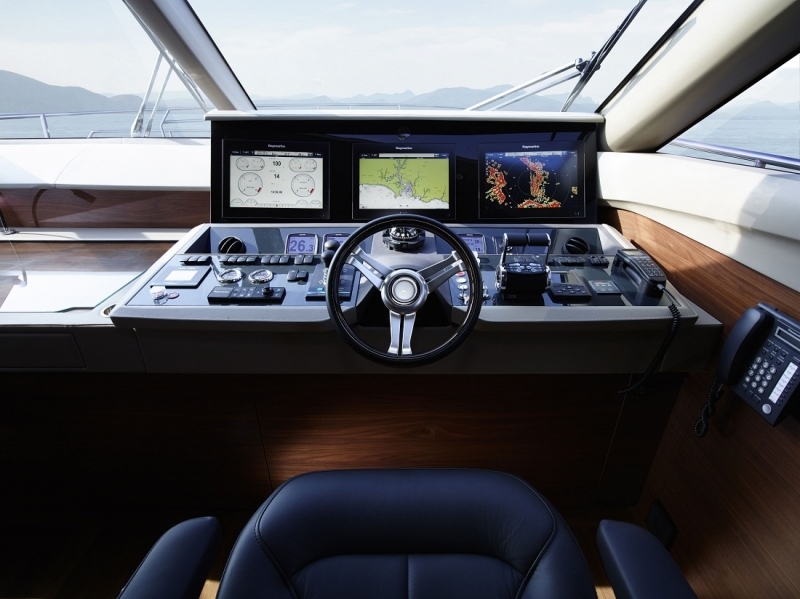 - Excellent cruising performance and great autonomy in fuel. 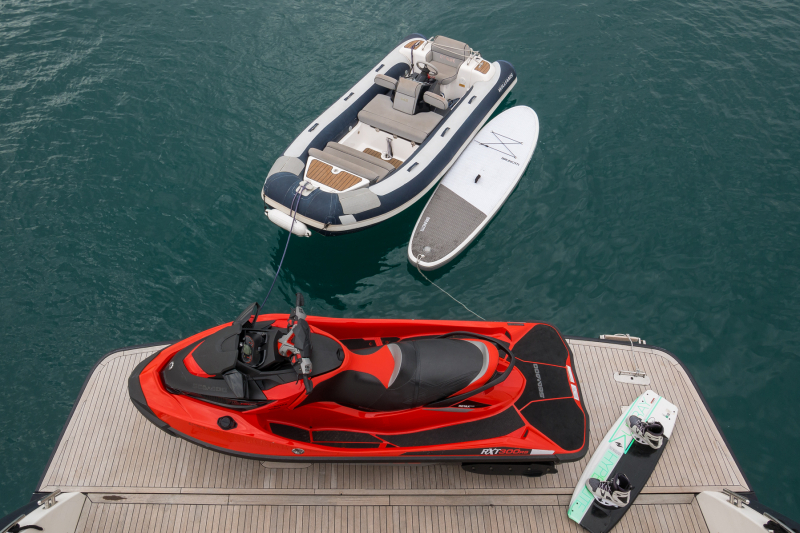 - Variety of Water Toys, such as: Large and fast tender boat: Turbo Jet Tender Williams 4.5 meters, JET SKI, 2 SEABOBS etc. 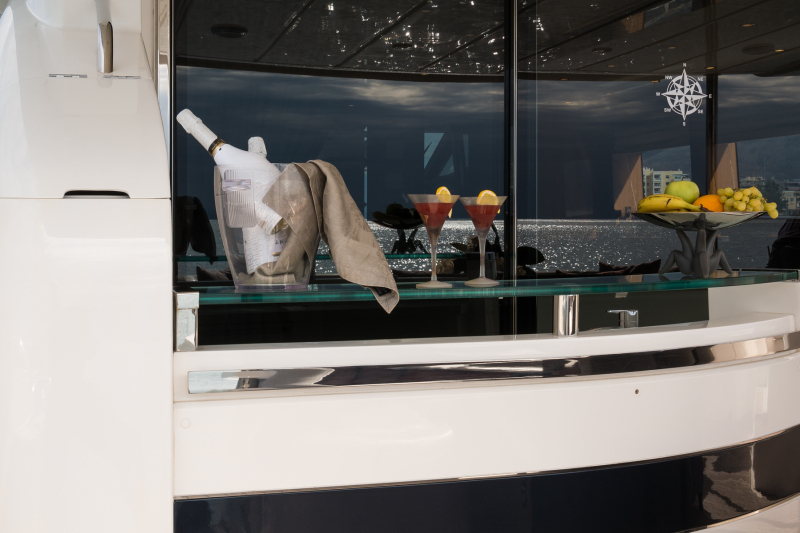 - Superb Crew of 4 (including a talented Chef). 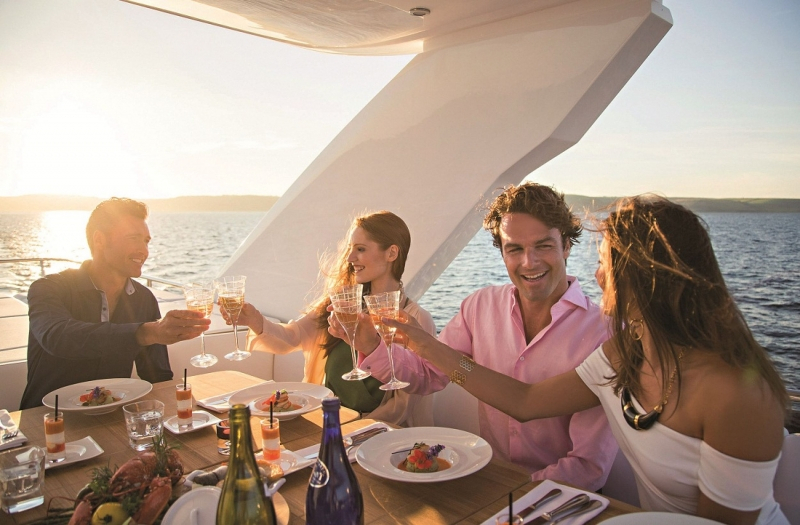 A 5th Crew person can be offered free of charge, on request prior to booking (subject to guests' number). 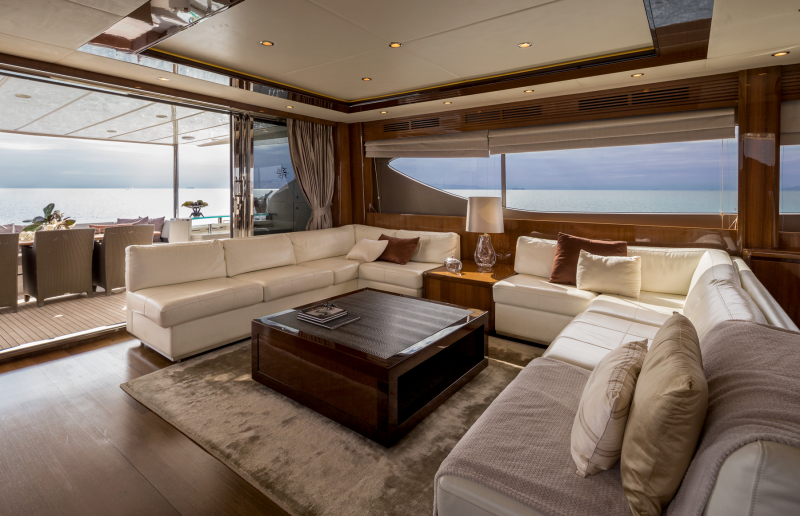 - Modern yet timeless rich interior, decorated with top quality carpentry, and expensive designer’s fabrics, leathers, accessories and linen. 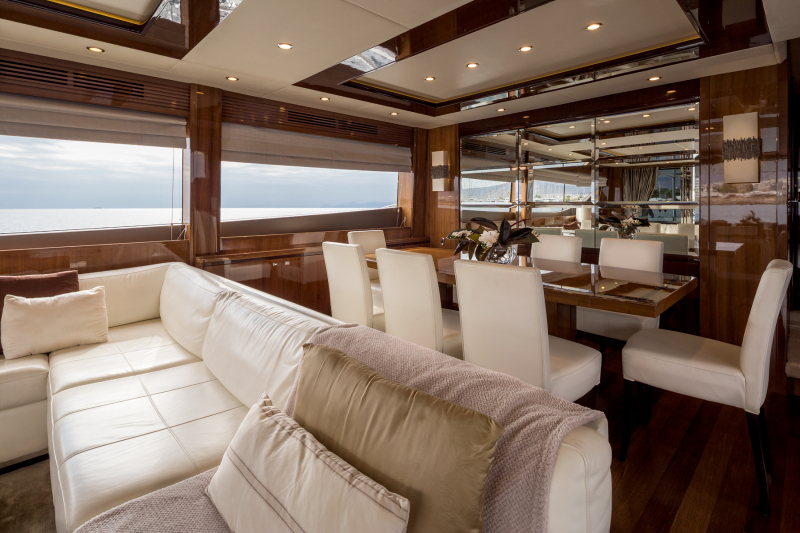 - Large panoramic windows in salon providing natural light and panoramic views. 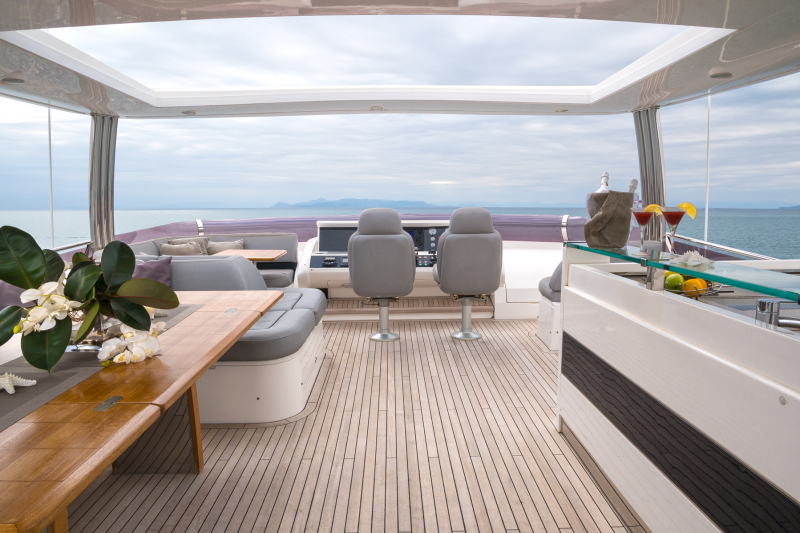 - Modern Hard Top on fly bridge with electric retractable canvas roof. 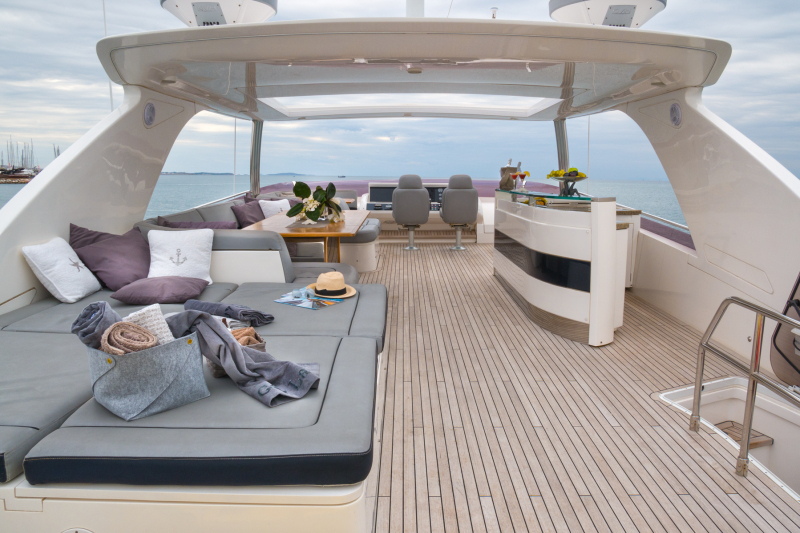 - Fantastic bow lounge with couch, teak table, bimini top for sun protection and sunbathing area. 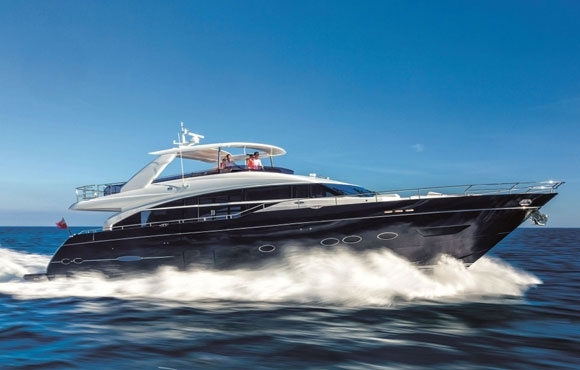 - One of the latest models of the world famous Princess Yachts, UK, one of the very few built worldwide and the only one in Greece. 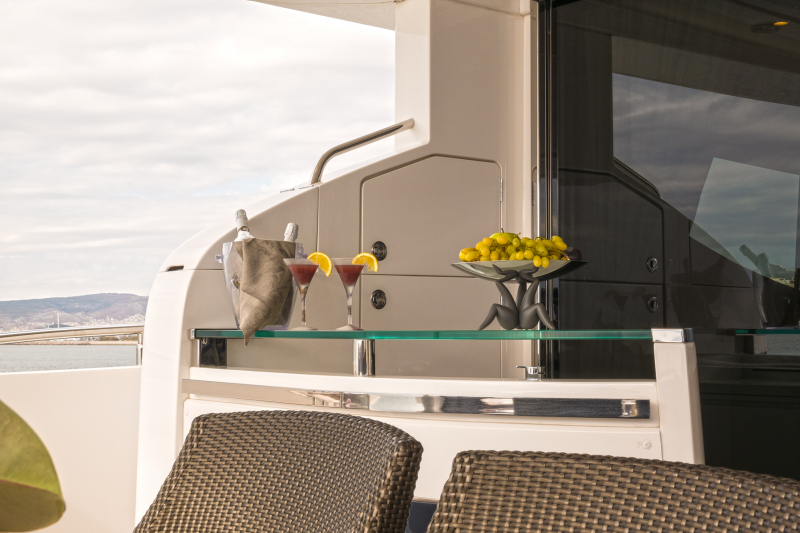 MAIN DECK: The welcoming setting of 4LIFE’s salon invokes the comfort of home, allowing casual conversation, relaxation, and breathtaking views from the large panoramic windows. 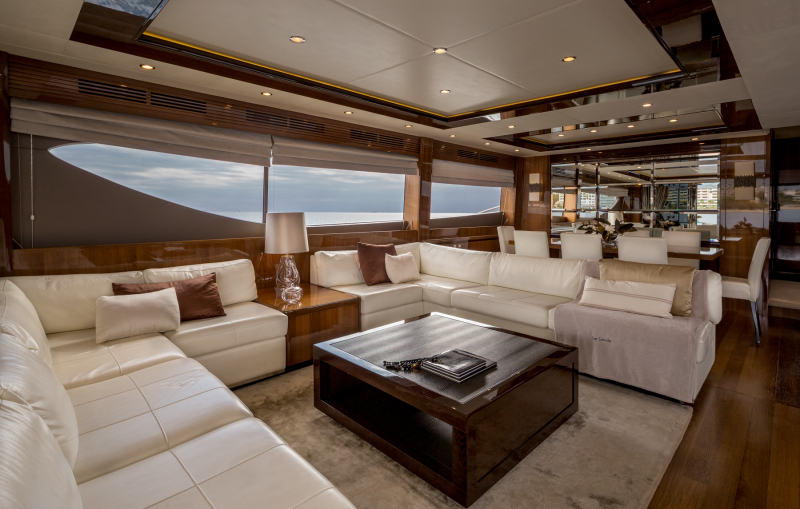 The attention paid to detail with expensive top quality materials, leathers and fabrics accentuates the luxurious atmosphere. 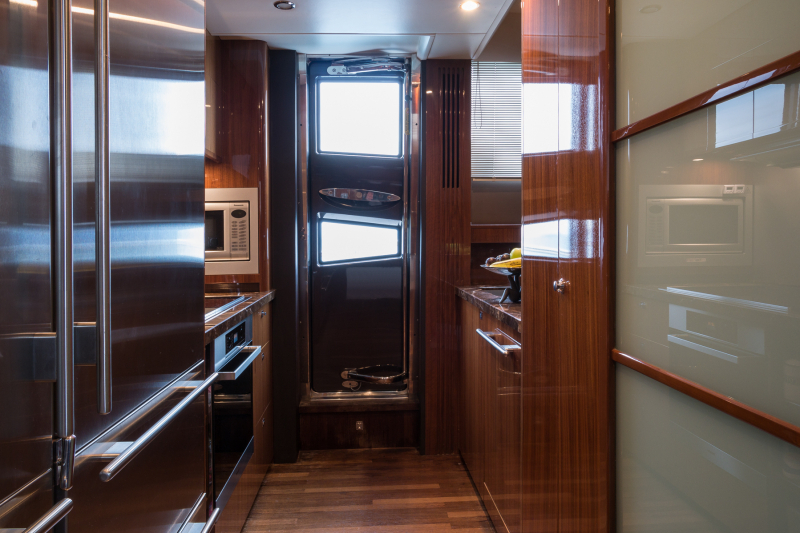 On the main deck’s interior there are also, the dining area for 8 persons, the galley, a day head (accessed also by the pilothouse) and the bridge, with a small semi-separate dinette. 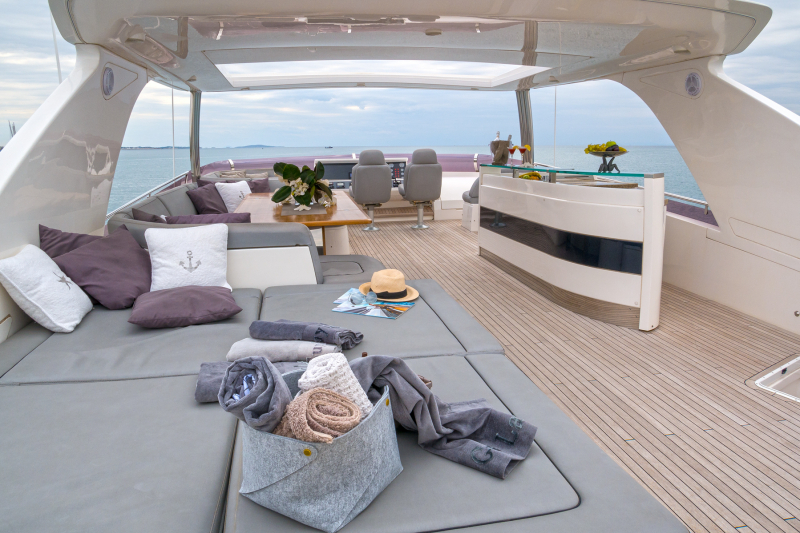 The perfect environment for socializing, dining and entertaining is the ample aft deck thanks to the large U-shaped settee shaded by the fly bridge overhang on the aft deck. 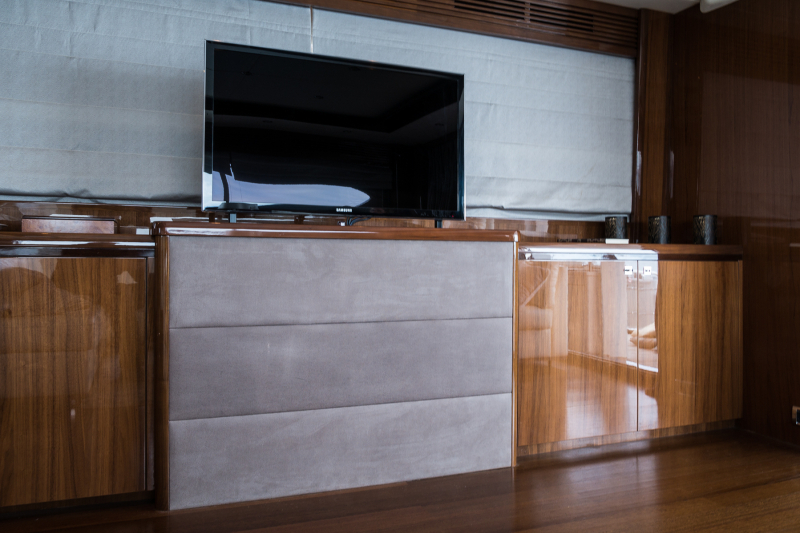 It features a large foldable teak dining table, comfortable chairs and a large bar, with a fridge and a sink. 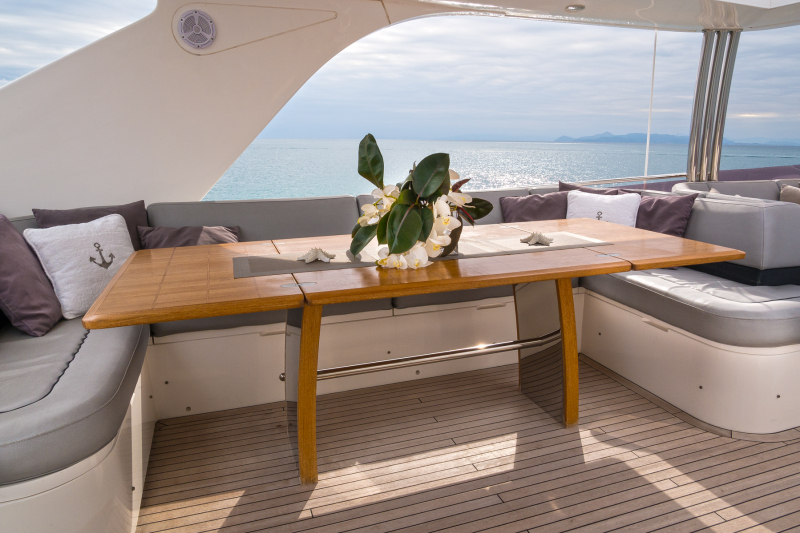 One of the most popular areas of the yacht is bow. 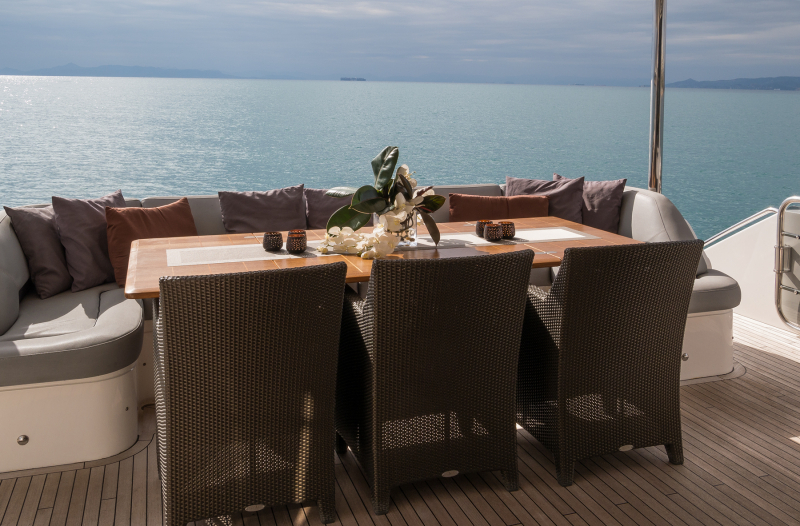 It has a fantastic lounge with a teak table, protected by the sun with a tent, ideal for drinking cocktails and enjoying the proximity to the sea and panoramic views, while cruising at low speed or when anchored. 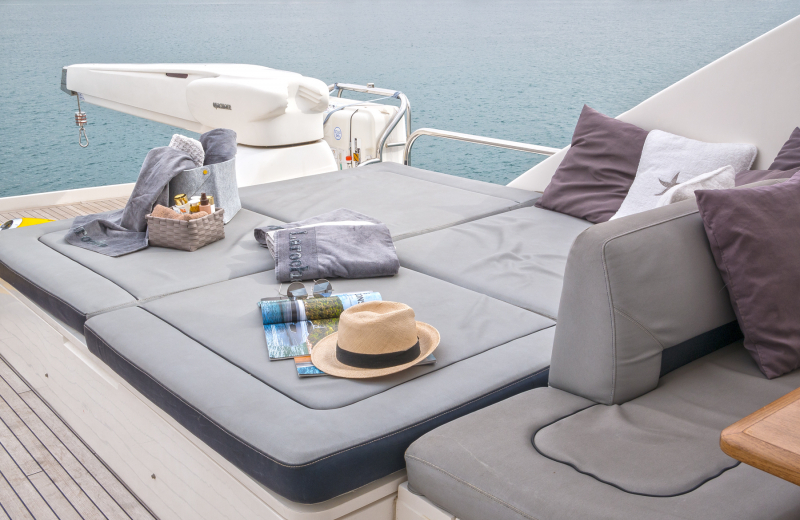 Its cushioned area is also ideal for sunbathing or just relaxing. 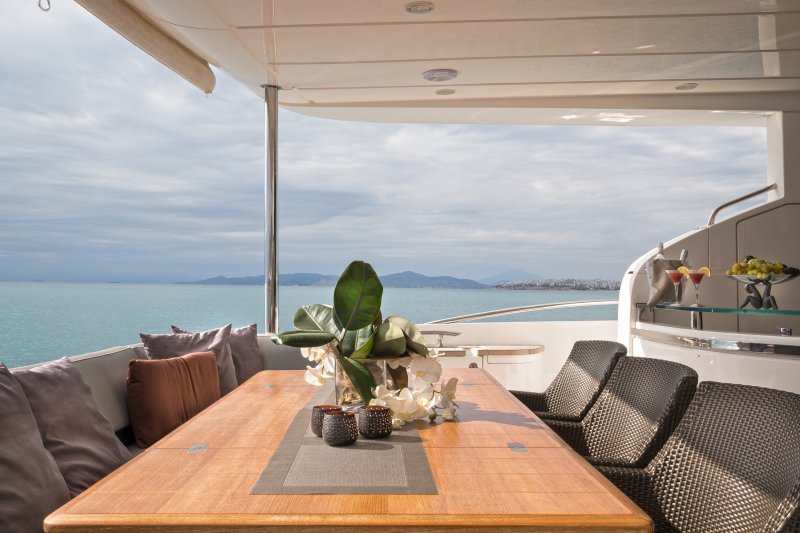 FLY BRIDGE: Careful emphasis is placed on creating a spacious gathering area on the fly bridge, made apparent by the large seating area to port featuring a large dining area with a foldable table, rounding out into an intimate dinette forward. 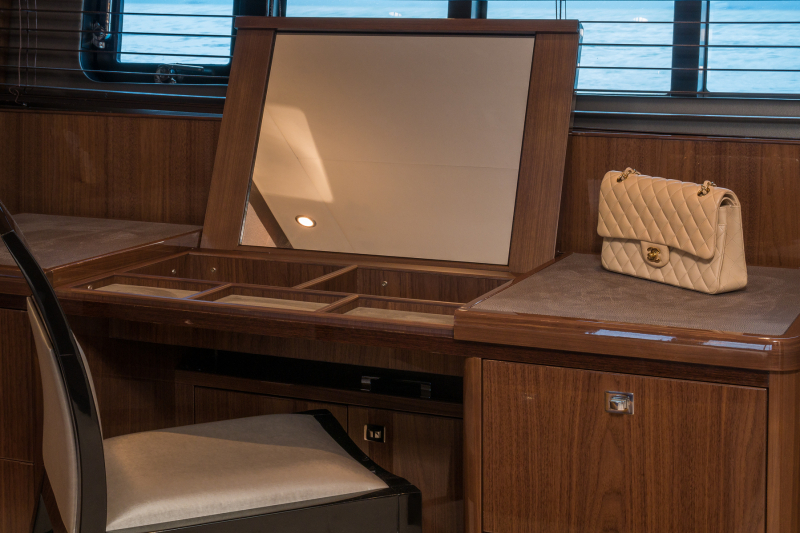 She has a raised sun pad aft with ample storage beneath. 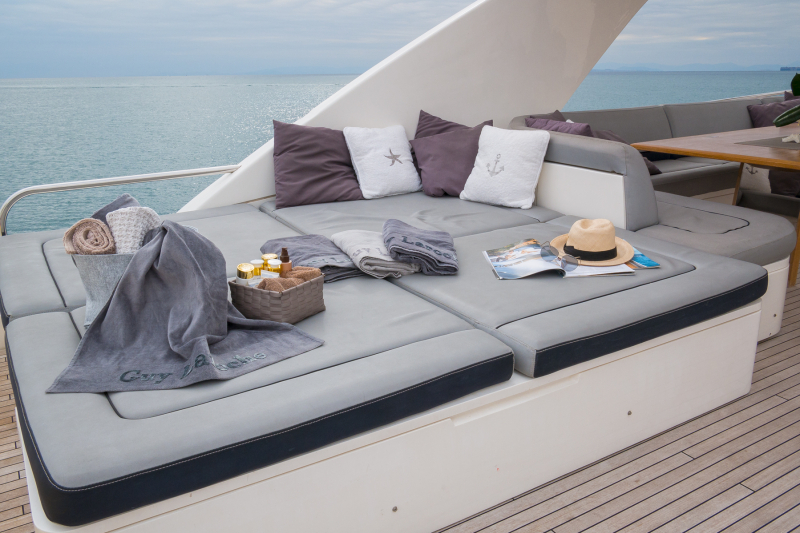 An L-shaped bar to starboard is centrally located and convenient to both the seating and sunning areas. 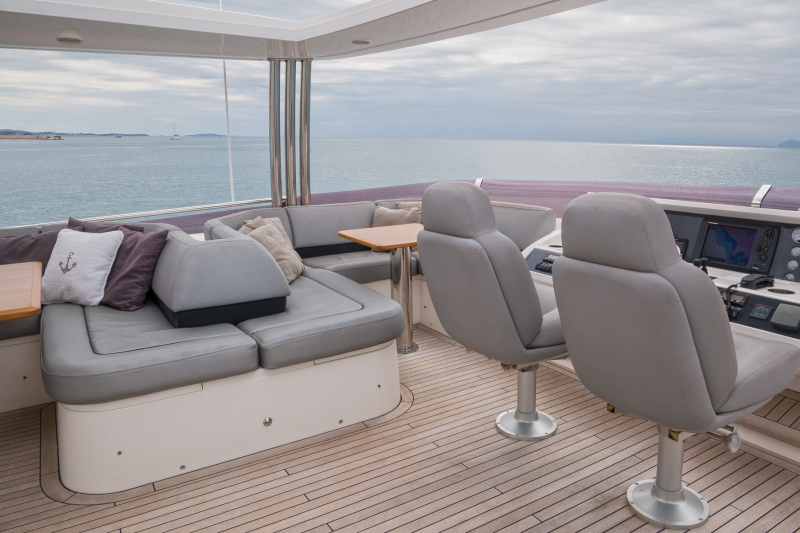 The forward helm provides optimal cruising visibility, while the starboard companion seating is ideal for a guest who enjoys watching the navigation or a chat with the Captain. 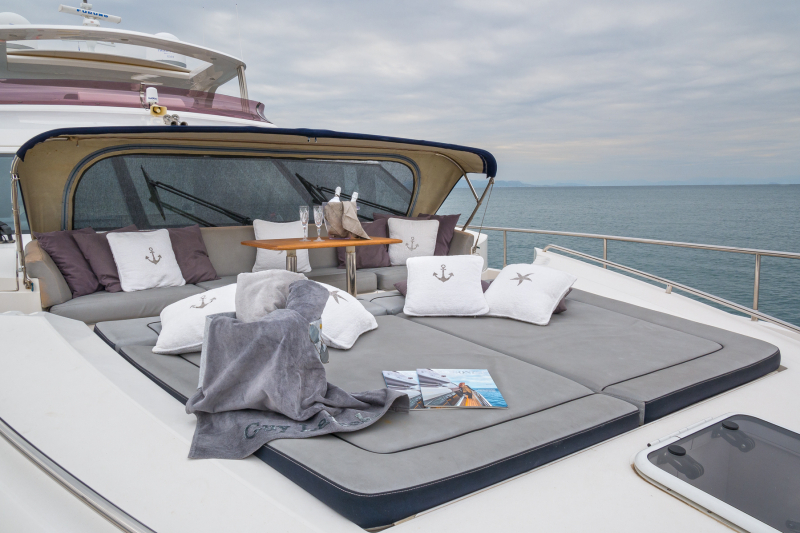 Its modern fixed hard-top, surrounds an electric retractable canvas roof which unfolds automatically to offer stunning views of the azure blue Greek sky during the day, or the stars during the night. 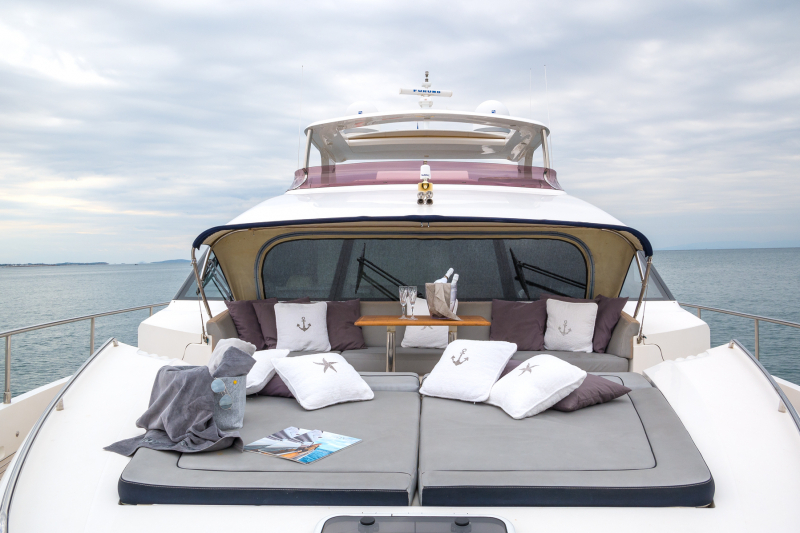 SINKING SWIMMING PLATFORM: One the most attractive features of 4LIFE is her fantastic sinking swimming platform, which offers direct access to the sea end endless hours of fun. 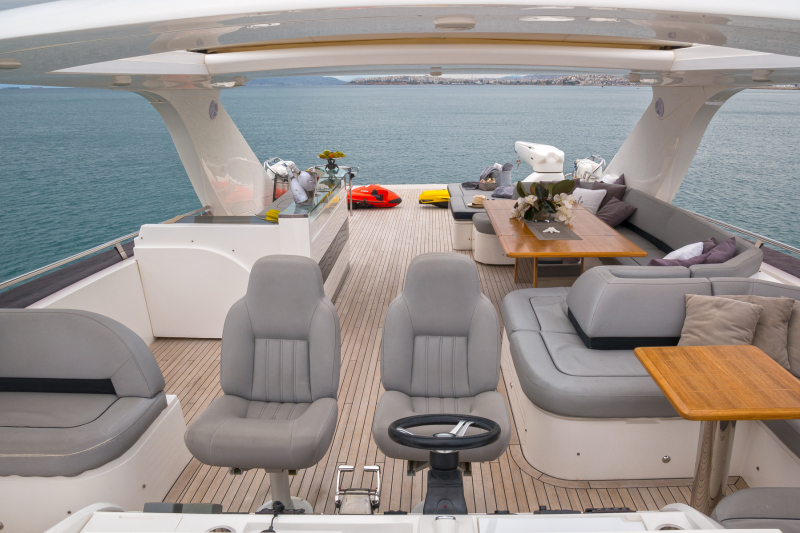 With its large electro-hydraulic davit it carries the Jet Ski, allowing tender storage on the aft portion of the fly bridge. 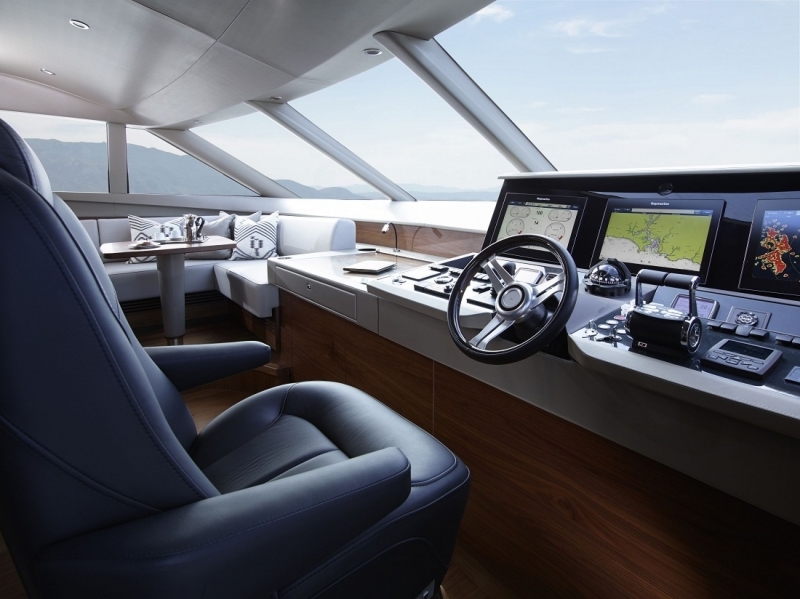 SATCOM System: Communications, INTERNET access, and live satellite TV. 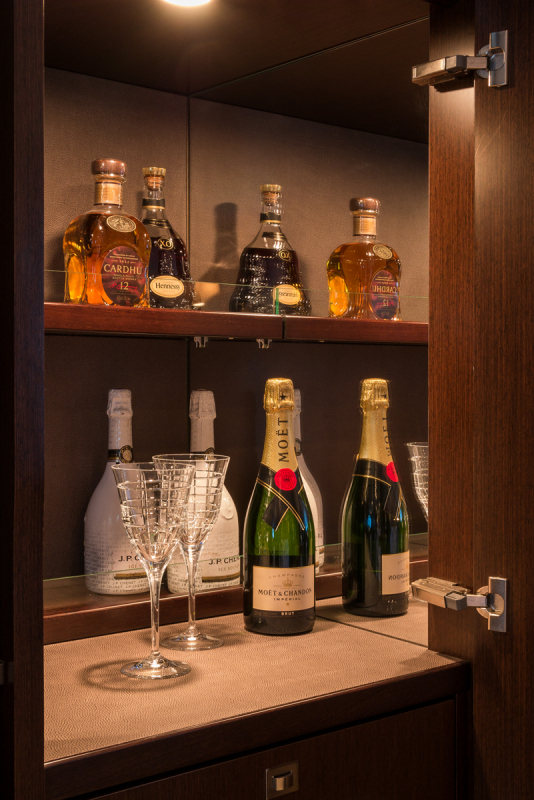 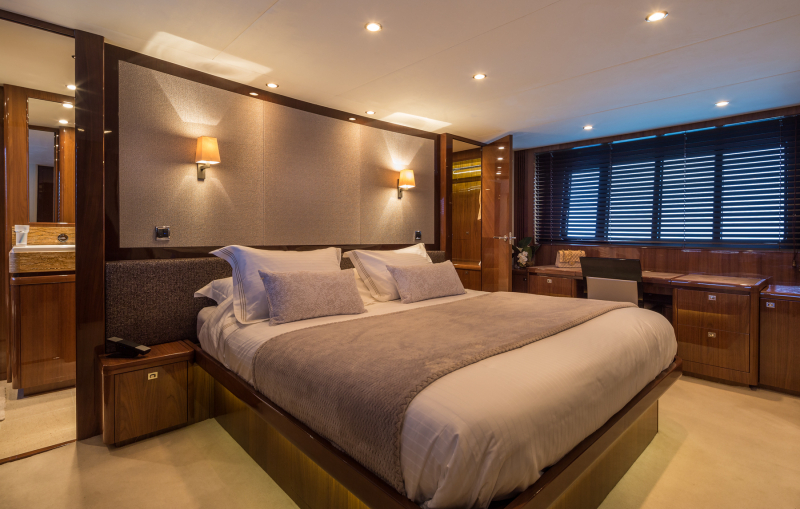 Accommodates with comfort 8 guests in 4 luxurious cabins, all with en suite facilities. 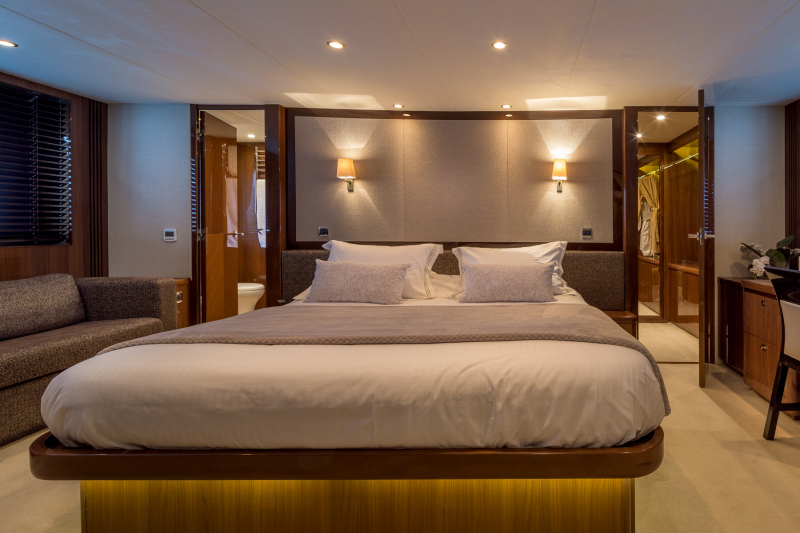 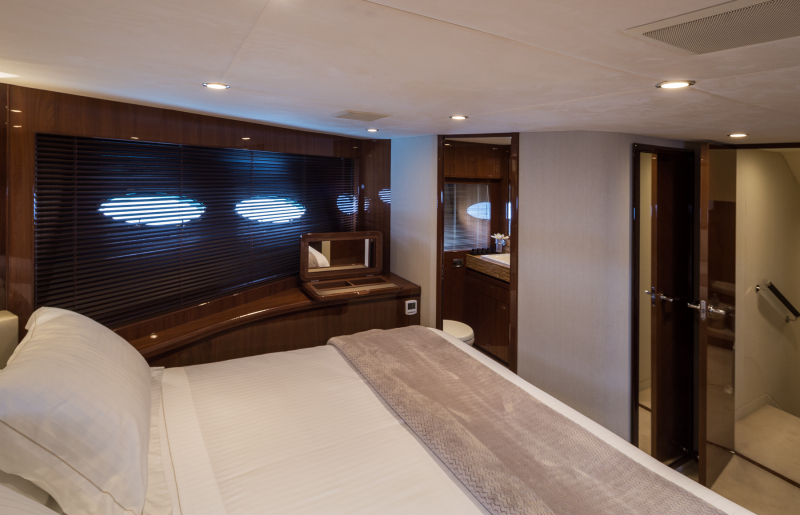 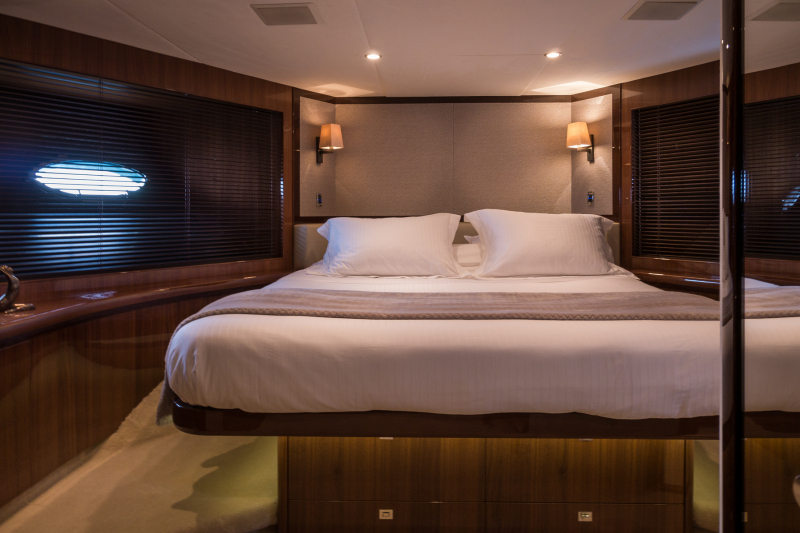 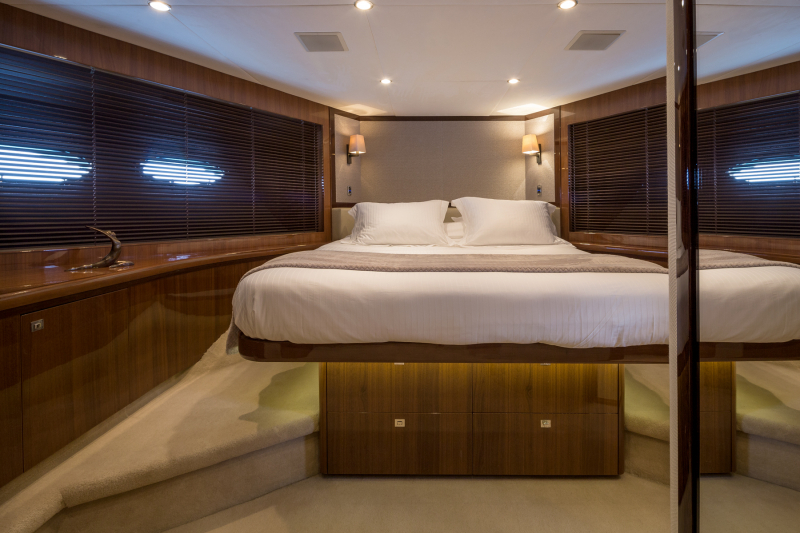 The impressive amidships full beam Master suite is flooded with natural light through large hullside windows. 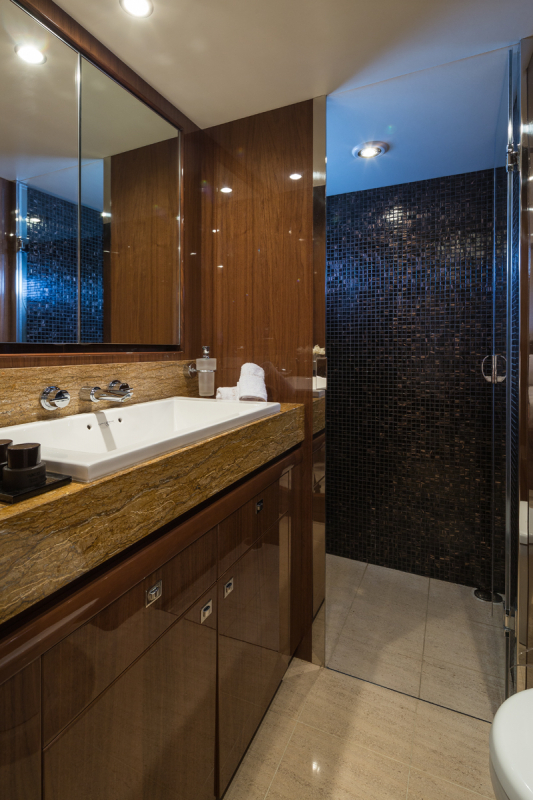 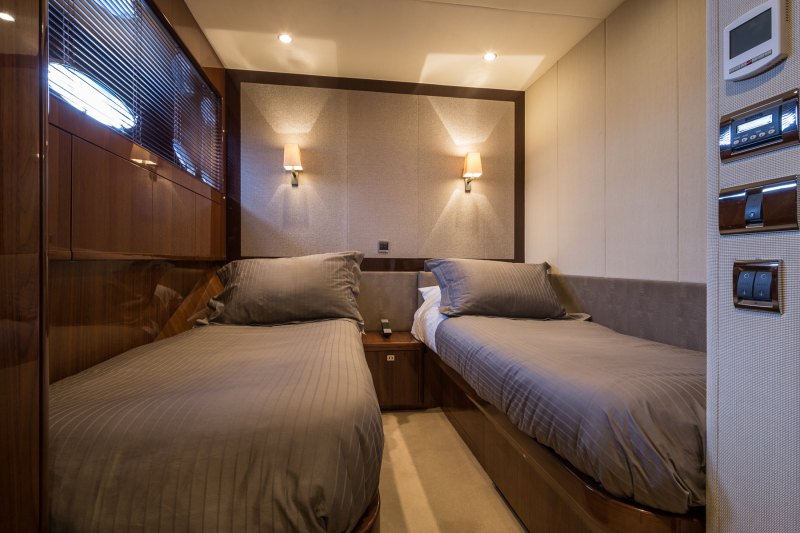 It features a King sized bed (1.87m width), a spacious walk-in closet, a large sofa, a vanity desk, a mini bar, Bose surround Hi-Fi system, Sat TV/DVD and an en suite bathroom, a stall shower and two sinks surrounded by marble. 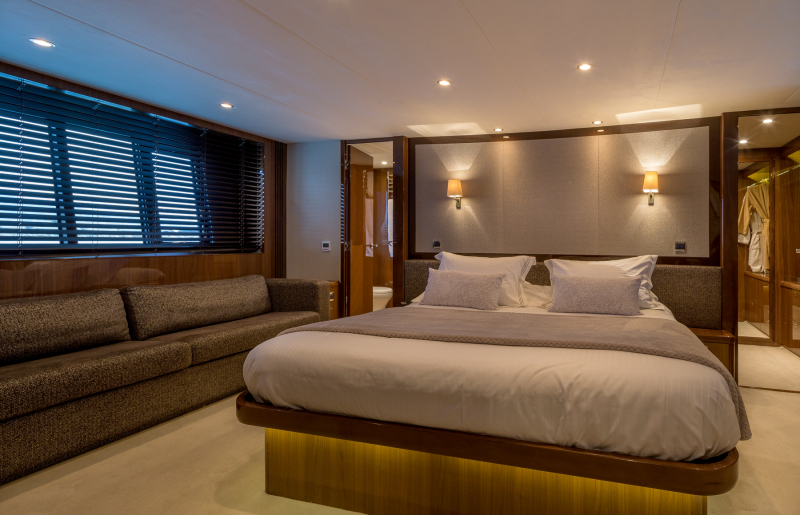 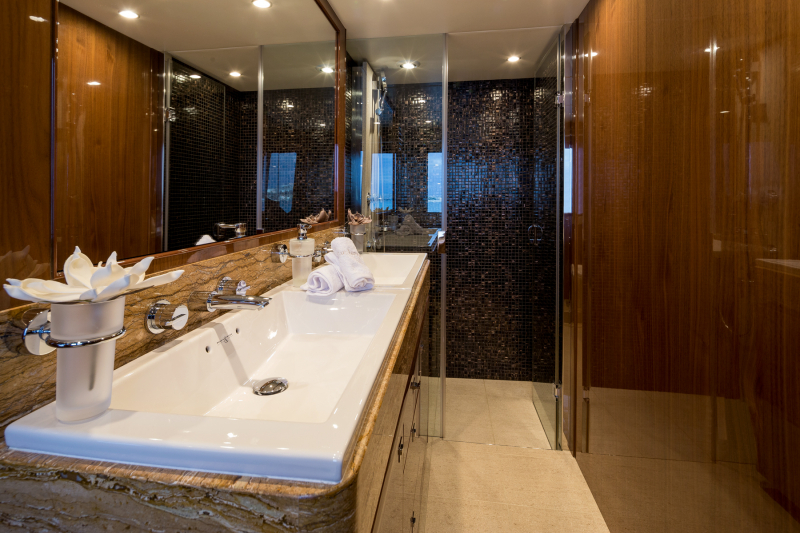 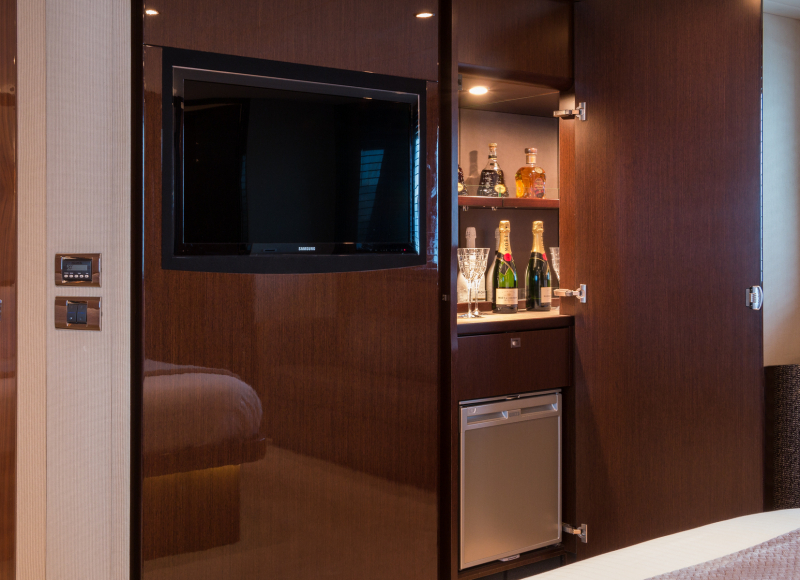 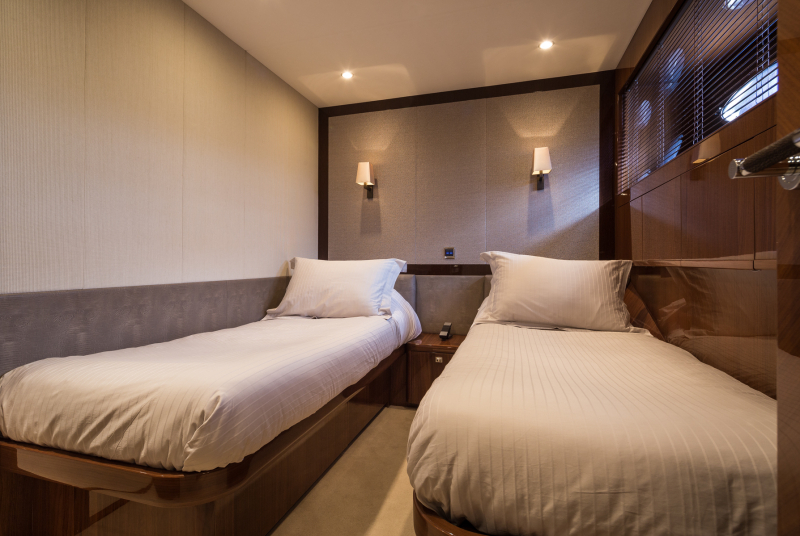 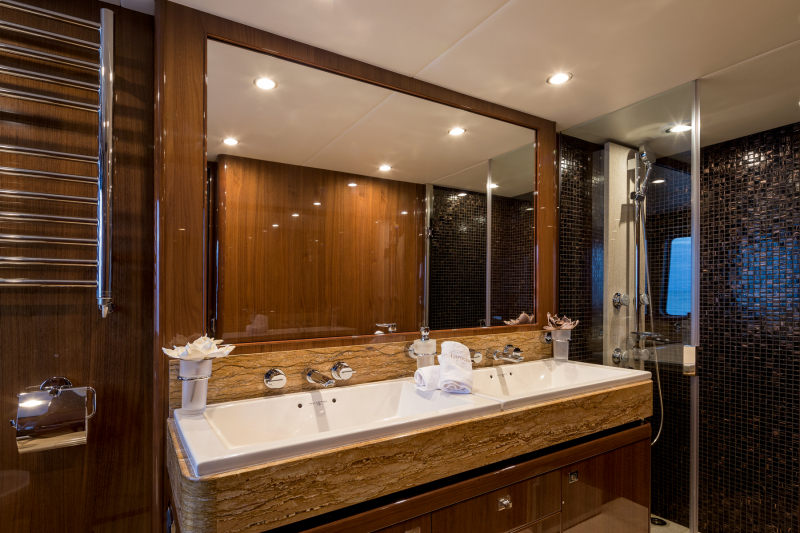 The VIP Cabin features a King sized bed (1.87m max width), Sat TV/DVD, HiFi system and en suite bathroom with one sink surrounded with marble. 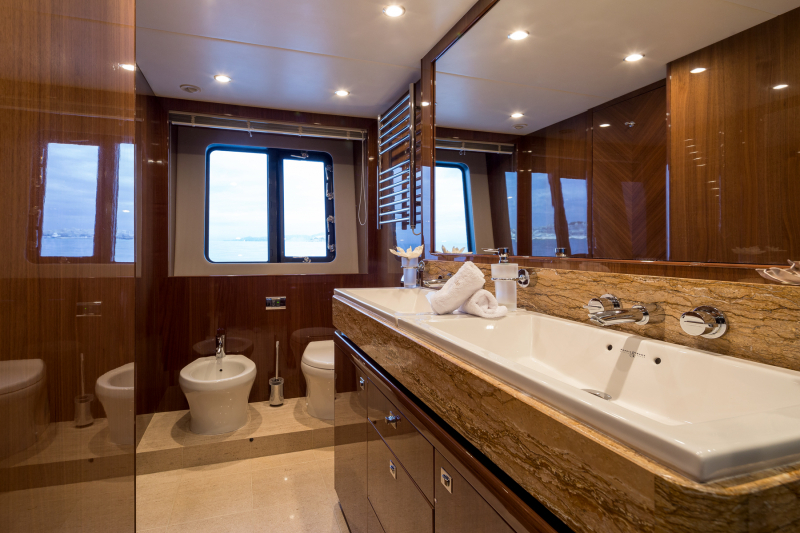 The Two almost identical Twin cabins have TV/DVD/Hi-Fi and en suite bathrooms with marbles. 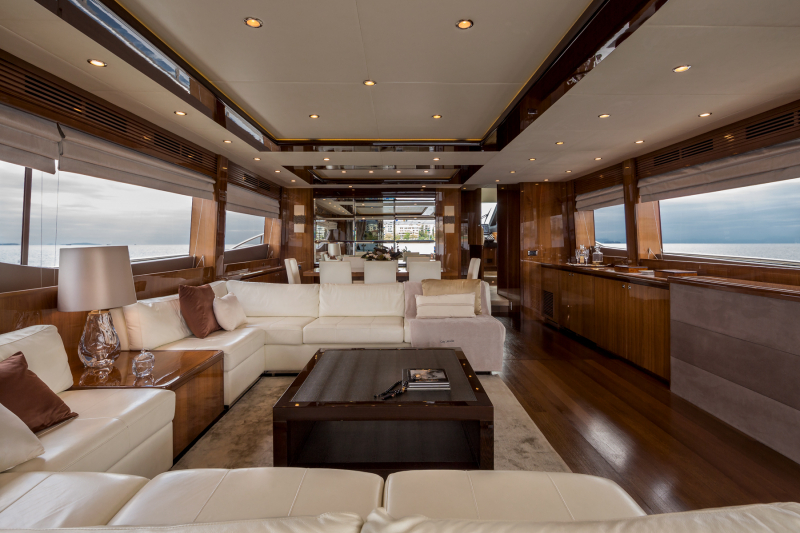 One day head on main deck. 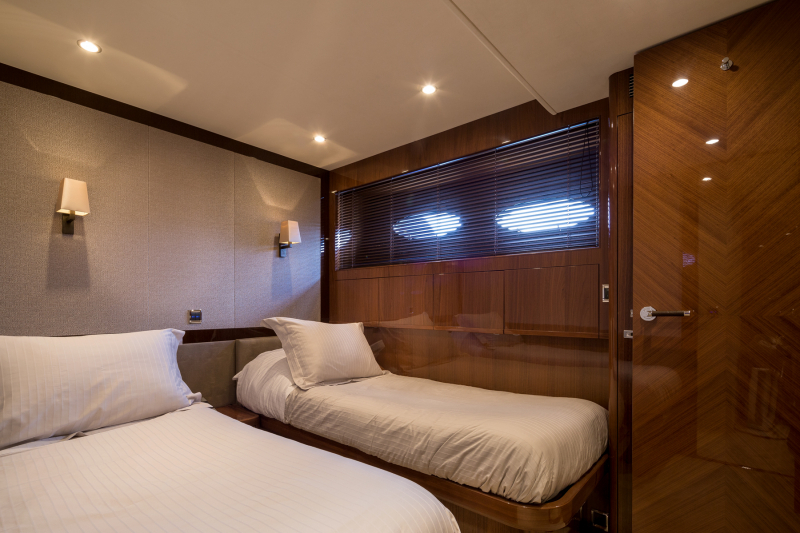 Crew enjoy separate quarters.